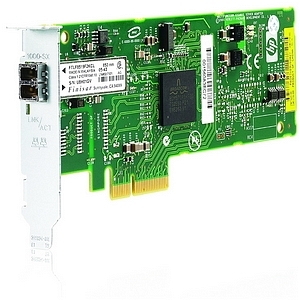 The HP NC373F PCI Express Multifunction Gigabit server adapter is a high performance PCI Express multifunction network adapter that supports standard or low profile slots in ProLiant servers running over a fiber-optic network environment. The NC373F is a four lane (x4) serial device with 92KB of onboard memory. In addition to delivering Gigabit Ethernet networking, the NC373F supports TOE (TCP/IP Offload Engine), iSCSI (Internet Small Computer System Interface), and RDMA (Remote Direct Memory Access) over a single network connection.